The results are in and Lake Park is in no danger. The results were a landslide in our favor! ( I have heard about 600 to 15) Hoorraaayyy! Thanks to all that called and shared on facebook. We all appreciate it. Isn’t it great when people come together for good? The City of Reno is threatening to fill in our beloved Lake Park pond. The pond is home to tons of wildlife 🐸 🦉 🦆 🐥that would be negatively affected among many other issues it would create. Thank you and PLEASE SHARE with your friends. Elizabeth has taken the helm on this. Thank you Elizabeth. If you would like a phone number. Send me a message and I will get it to you. Thanks to all of you for attending our meeting last Saturday. I am immensely grateful to you for your commitment to preserving the lake and to our joint effort to improve the park as a whole. Some agreed to attend the NAB meeting at City Council Chambers at 6 pm on June 12th. Another is on the Board of Scenic Nevada and volunteered to bring our issues to that Board. Still others agreed to find the original documents which gifted the park to the city because we need to know those terms and conditions. Still others volunteered to make signs and alert passersby to join our effort and text code 165651to 650-600-9016 before the June 17th deadline. Many have called the Mayor’s office, city council members and legislators. I have received a number of calls from neighbors who were not able to meet last Saturday but are concerned and willing to support preservation of the Lake. You raised important issues: the value of the Lake’s water rights, the need ameliorate and aerate the lake, the beginning of a ‘wetland’ on the east side of the lake, preferences given to newer developments, the decline of the lake in relation to Rancho’s creation. faulty de facto notice of the survey, and the survey’s deficiencies. Expertise and experience in the group potentially allows us to work constructively with the city to improve the lake, not just leave it as is. Changes have happened since we met. Nevada Wildlife removed the remaining geese two mornings ago, roughly, according to those who witnessed the event. Yesterday a park employee edged the sidewalk around the lake. A warden has been circling the lake today. 60 Anson Drive and also photograph the park. Please come if you are able. I suggest we meet again next Saturday, June 9th, at noon, in Lake Park to see what we’ve accomplished and move forward. The counter tops are beautiful! The snow is finally here in Reno but that means all projects stop. So this is the stage we are at until skiing season is over. Next up, handles and back splash. A kitchen remodel. Now that I am living in the midst of a remodel, I totally get why someone always cries or becomes otherwise, insane. Not having a sink will do that to a person. As will wildly different prices and function between items. 1st place I look. Has beautiful quartz. Super nice dude too. Happy to help me and understands that I am the type of person that needs at least three different quotes before I commit as I cannot sleep if I don’t do my due diligence. What causes the biggest fight in my house. I ask my husband to put down plywood so I can have a counter-top.. He sees it as a waste of money. I see it as needing to not want to kill everyone. I get half of my wish. I get half of a plywood counter and I only want to kill them all, a little. “That beautiful marble counter top, oh it will be fine in your kitchen. Yeah its only $400 per slab, you will need two.” When they say it that way it feels like a steal compared to the $600 quartz I picked out. And it is Marble. If that doesn’t say “Classy” then what will. Me: ” um.. ok.” Note: this was 3 days ago. I still haven’t gotten a quote from this guy. I don’t want granite. So.. they will be here Monday. I’ve kept 4 chickens, 2 dogs (debatable) and 2 kids alive this long. Let’s see if I can manage not to destroy a big flat rock. Wish me luck… Check back Monday to see what happened. So. I’m behind on my goal. Like really behind but, I will forge on. 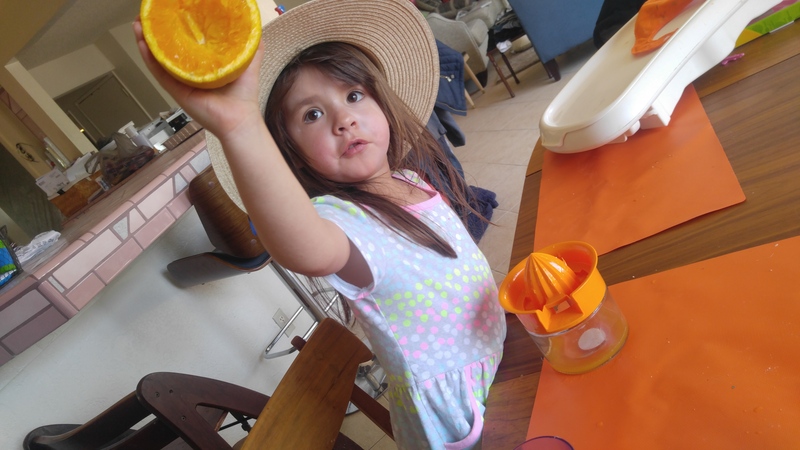 Today I’m making coconut pudding with my little one who has asked to “juice oranges”. And some shredded coconut for topping. 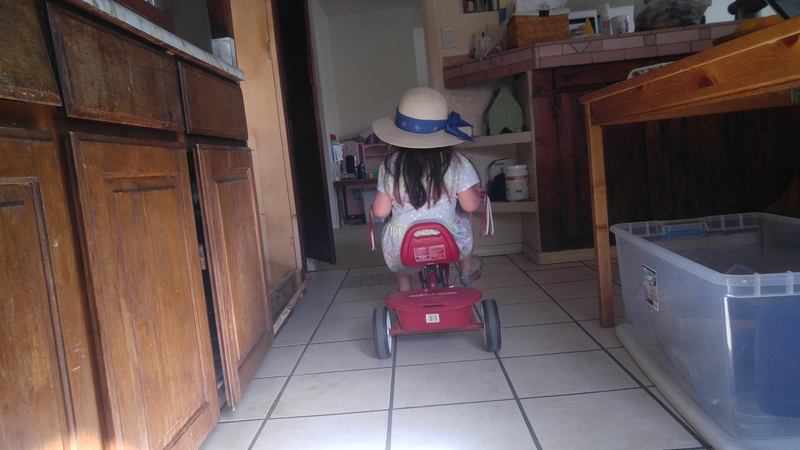 I also have to avoid a tricycle. Next open the can of cream. Huh, weird. It’s firm.. I’ll poke it with a rubber spatula. Wipe quarter cup of coconut cream off my shirt. It’s chunky. Not at all the cosistancy I expected. When you taste it, it’s like coconut oil in sweet liquid. So far, looking horrible. Next is 2 tablespoons of coconut cream. It is either a can opener or one of the can pokey openers that I’m going to have to use..
I’m going can opener. Hmm. It’s also very firm. Since the spill I’m no longer precisely measuring. I’m going to guess with a kitchen spoon. It tastes and feels like a sunscreen that would have a monkey on it. I rub it in my hand and now I smell like Spring break. I scald the coconut and then add the flour and cornstarch to 5 the mixer. 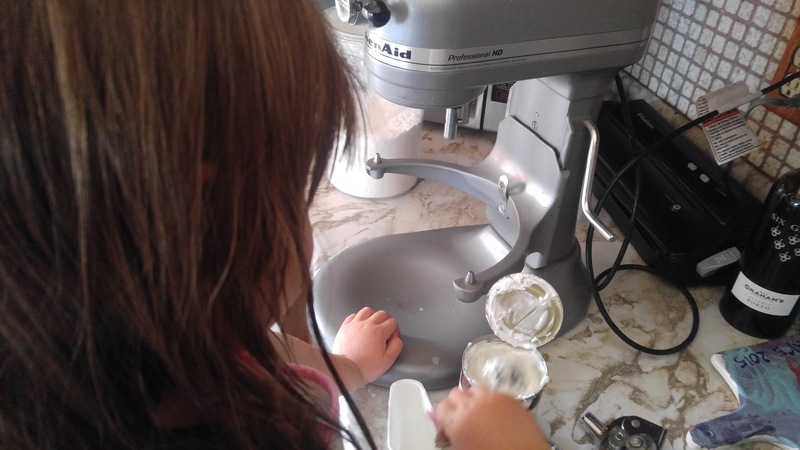 The kid tries to to add the leftover egg white to the mixer. Caught in the nick of time. Temper the eggs is next. That goes fine. Transfer back. All is well. Damn! That sunscreen says “Shake well before using”, so I poke it. Yup. There is a thin liqid down there. The kid starts poking it vigorously. It says to “wisk for 5 to 10 minutes”. That isn’t happening with my family. So, I cranked up the heat and worked vigorously for 3 minutes. It thickened fine. I forgot the vanilla. I spashed it in and called it good. Early tasters, me and Bea, were split. She thought it was great. I think it tastes like sweet coconut oil. Maybe it will be better when cooled. It fit into 4 small ramekins. And I toasted some coconut in the toaster oven to top it off. Verdict. It’s alright. The toasty coconut on top was the best part. Everyone ate all of their dessert without complaining. It was much better after 4 hours of refrigeration and digging a sprinkler system. 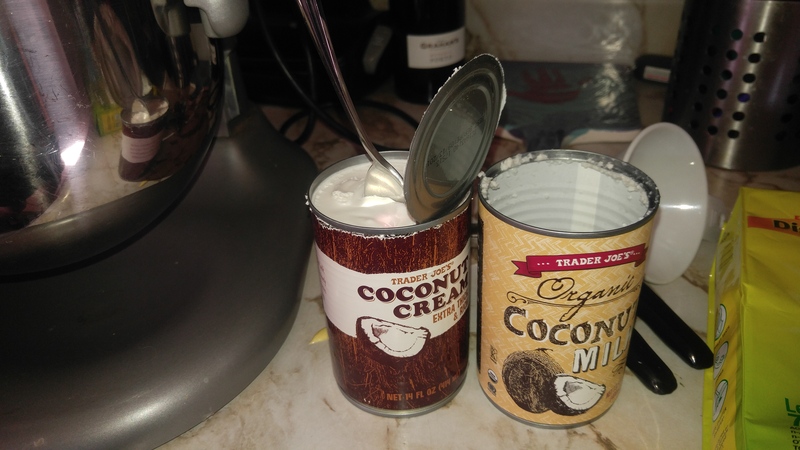 Now, what to do with the canned coconut. I think it will probably make an appearance in the oatmeal tomorrow. 11 down. 39 desserts to go. My new years resolutions have always been pretty simple and really more like fun personal challenges. The year I met Joe I had resolved to wear false eyelashes more often. One year I ate all of the unique flavors of chips I could find. (that one stuck). This year I started with “make dessert more.” It sounded lazy and not really interesting. So after many iterations it is this. 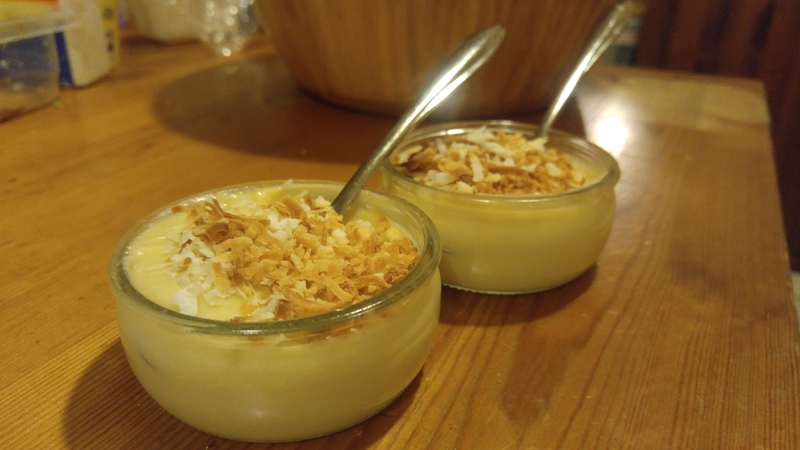 Make 50 unique desserts, that I have never made from scratch, in one year. Oh. And we are in March and I have had no oven this whole time. And I have little kids. 7 months and 3 and three-quarters. (her self-described age). And I have 2 jobs. But. I love dessert and I feel like if I want dessert and I made it from scratch it seems worth it. My step mom said, you should make a book. This is it Glenis, this is as good as it gets. So it’s week 14.. At this point I should have 13 done to be on pace. I don’t. I have 10. some serious doubling up will have to happen. I’m not worried. I’ve always been good on a deadline. What have you learned so far, Autumn? I can get away with the same-ish items if I make different flavors. Tapioca takes a whole day to make and is more of a mousse texture. In really bad at folding in egg whites but I’m getting better. Let me know. What should I make? And here is this week’s tapioca. I used the recipe on the back of the bag of tapioca. I figured that they probably have this on lock. And they do. Success! It’s delicious and oh so fluffy.